The research began with an investigation into the way that the immune system is involved in a crucial activity: clearing away old, senescent cells that spell trouble for the body when they hang around. 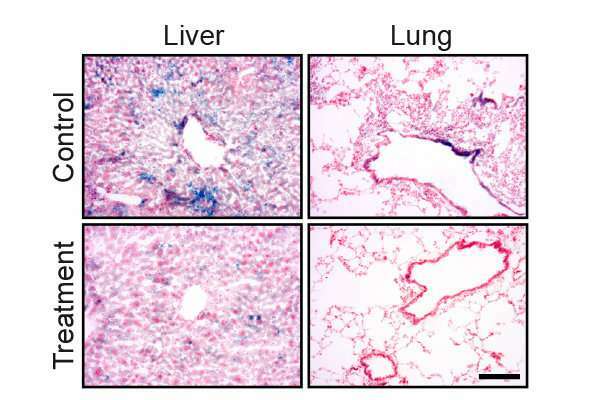 Senescent cells—not completely dead but suffering loss of function or irreparable damage—have been implicated in diseases of aging by promoting inflammation. The researchers used mice in which a crucial gene for this immune activity was missing. At two years (elderly, for mice), the bodies of these mice had a greater accumulation of senescent cells compared with the mice in which the gene for removing these cells was intact. The mice missing the gene suffered from chronic inflammation, and various functions in their bodies appeared to be diminished. They also looked older—and died earlier—than their normal counterparts. Next, the researchers gave the mice a drug that inhibits the function of certain proteins that help the aging cells survive in their senescent state, to see if this would contribute to the removal of these cells from the body. The drugs were administered to mice whose aging was a result of the malfunctions the group had uncovered in the immune system as well as those suffering premature aging from a different genetic error. The treated mice responded exceptionally well to the drug: Their blood tests and activity tests showed improvement, and their tissues appeared to be much closer to those of young mice. The scientists counted senescent cells, finding many fewer of them remaining in the treated mice's bodies, and when they looked for signs of inflammation, they found that this, too, was significantly lower. The mice treated with the drug were more active and their median lifespan rose. The scientists intend to continue exploring ways to prompt the human body to remove its old senescent cells, particularly to find means of activating the immune system to do this job. If future experimentation proves their theories correct, they could end up creating truly "anti-aging" therapies.